The “Old Sun” public House stood in Coleshill Street, and was demolished in 1938 to make way for Vesey Gardens. It was on the opposite side of the road from the childhood home of Richard Holbeche, and he mentions it in his Diary of 1890: “Who kept the Old Sun before William Betts I do not know. I do know that Betts must have been a very popular host, for in the pre-railway days his house was a great meeting-place for Birmingham tradesmen who on Sundays drove their wives in gay bonnets, to take the Sutton air. They came in smart dog-carts drawn by fast trotting ponies of a type not now met with.” Thomas Betts was at the Old Sun in 1844, and William Betts was there until 1868. The first record of the building is a conveyance of 1646, when it was probably a farm house, and from 1703 to 1751 the house belonged to the Cockersole family. Abraham Outon bought it in 1751, and he developed the property by replacing two outhouses with dwelling houses on the Coleshill Street frontage. 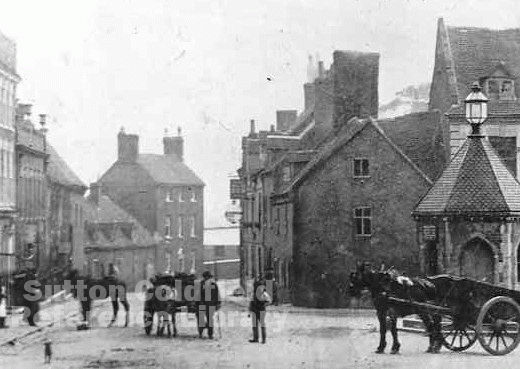 Outon changed the use of the building to a public house, which was inherited by his innkeeper grandson, Thomas Alldridge, in 1809 when it was known as “The Sun public house”. William Alldridge inherited from Thomas in 1819, and the directory shows Alice Aldridge as the landlady in 1835. William Goodwin, another innkeeper, was the next owner - he also owned the Beggars Bush - and William Betts was the licensee. Richard Holbeche’s brother Thomas bought The Old Sun for £1050 in 1875, keeping Charles Kemp on as licensee and then leasing it to the Holt Brewery of Holt Street, Aston, from 1890. Richard Holbeche remarked on the popularity of the pub in pre-railway days, that is, before the summer of 1862. Then it was being run by the thirty-year old William Betts and his 34-year old wife Jane. If she could not spare the time from looking after their three children (William Thomas and Harry aged 4, 3 and 2) there were three servants to lend a hand - 23-year-old Emma, William, 17, and Mary from Buckinghamshire who was only 13.